First of all, let’s clear a big misunderstanding: Focaccia al formaggio is not a proper “focaccia” it’s not a flat bread with holes on the surface leaking extra-virgin olive oil. It is, actually, an ancient savory pie, mede of a shell of thin unleavened dough filled with a creamy and melted fresh cheese. 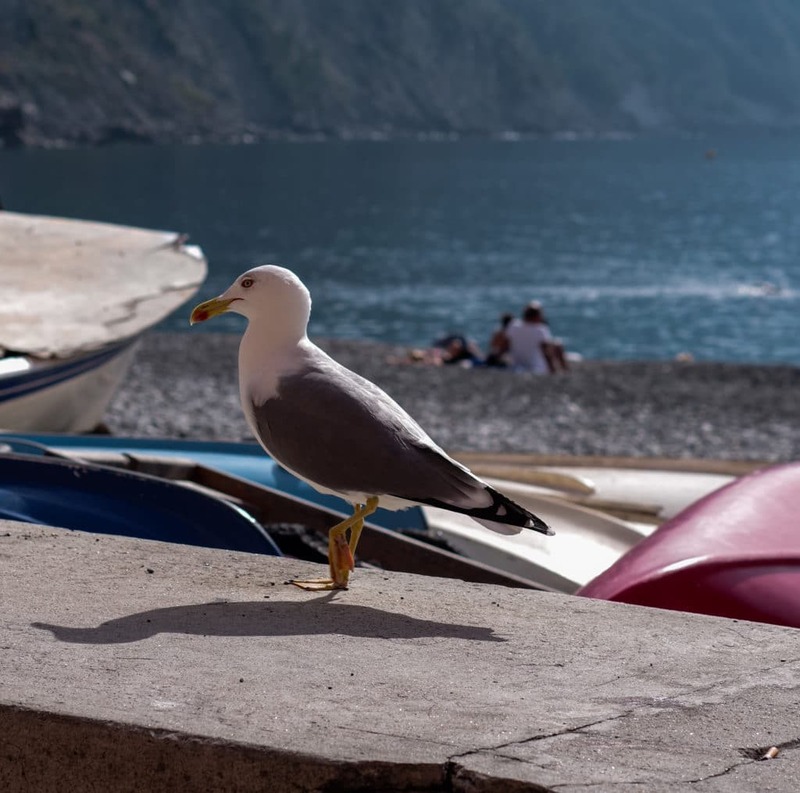 The capitol of this gluttony is Recco, a small coastal village few kilometers east of Genoa, as well as the small villages in its backcountry where indeed a fresh creamy cheese has been produced since century. There are documents backdating focaccia al formaggio even on 1198, when it was prepared to celebrate in the (wonderful) San Fruttuoso Abbey the departure of Liguria soldiers for the first crusade. 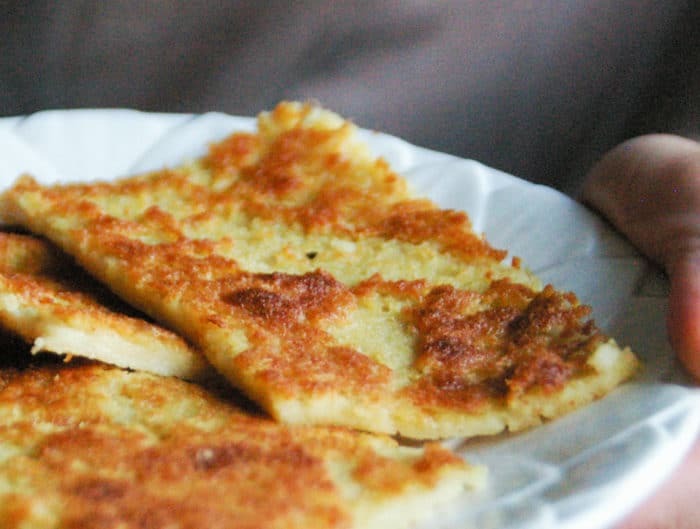 It is also said that in the Middle ages thanks to this food – made with the very few products available: flour, oil, fresh cheese and water – the Genoese population could escape the Saracen invasions taking refuge in the hinterland. In the 1800 this very local product started to became famous. People from Genoa, especially rich people, started travelling to Recco just to taste the famous focaccia (one of the first example of food tourism!) and many restaurants and bakeries started baking it every day extending the period in which it was eaten, previously limited to the Feast of All Saints, when the focaccia was given to the people for free. Nowadays, Focaccia al formaggio of Recco is one of the few Liguria IGP product, which means a food product that according to the EU regulations is protected because strictly linked to a defined geographical area and as far as produced in that area. This implies that you can taste the original “Focaccia di Recco al formaggio” only in a small area of the Italian Riviera (indeed the area around Recco and Camogli) and that any other cheese pie produced elsewhere – though with the very same ingredients and methods – cannot be formally called “focaccia di Recco”, on pain of a hefty fine! 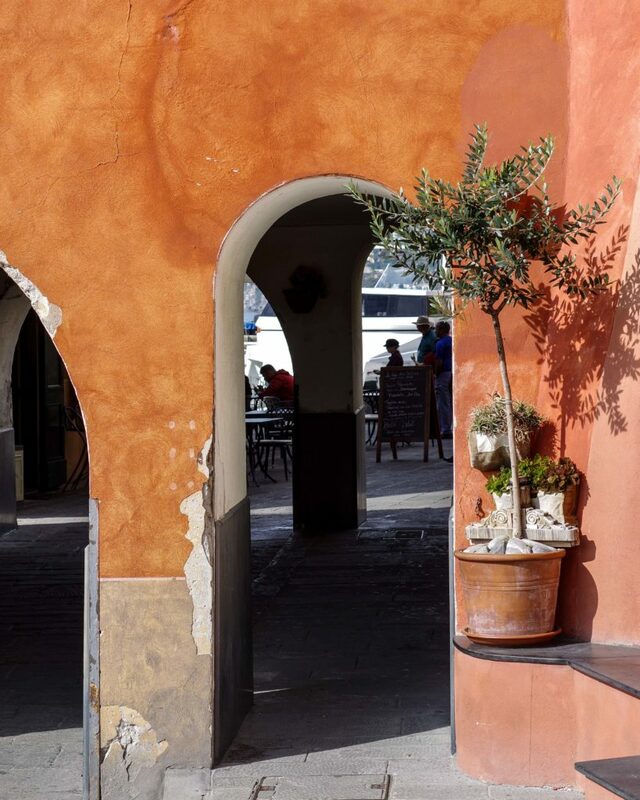 Here is the list of places where you can eat – or take away – the IGP Focaccia di Recco. The recipe of this pie has very few ingredients and is fairly easy:knead the dough, let it rest, stretch it in a thin layer, cover a cake tin, spread the cheese, cover with another thin layer of dough, seal and bake at high temperature. Mine is long, instead, because I want to follow you step by stepas if I were close to you. I give you small tricks and precise directions on how to prepare a perfect stretchy dough (commonly called “pasta matta” – creazy dough), which is the secret to obtain at home a focaccia al formaggiovery similar to the one sold in bakeries of Recco and Genoa. Even more! To show you the best how to prepare our Italian Riviera cheese pie I have prepare a short video. Watch it and you it will be a piece of cake preparing this plate! If you have a good olive oil, use it. It is not mandatory to use extra-virgin olive oil. Sometimes extra-virgin olive oil is too acid and too tasty and tend to cover the other flavors. Bake the pie at the highest temperature possible in your oven. Usually home ovens reach 280°- 300°C the newest. This will make the dough bake very quickly whilst the fresh cheese just melts without baking. 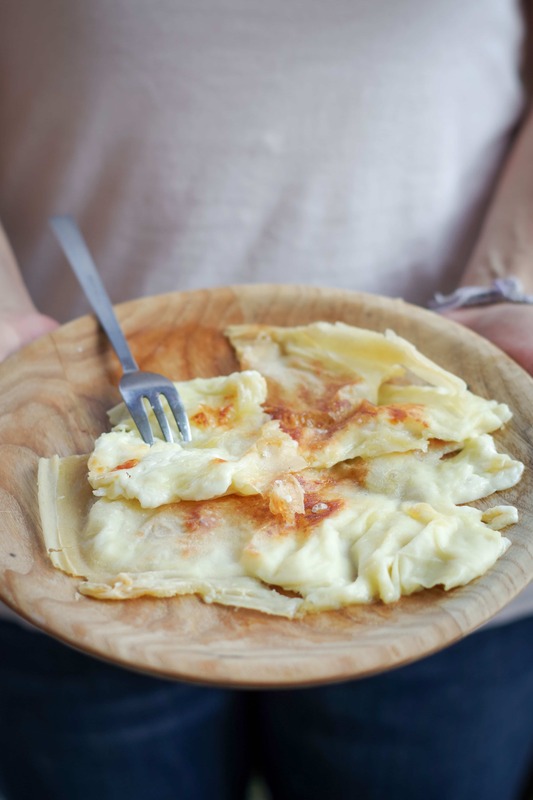 For making the cheese pie at home we usually use a fresh Italian cheese called “stracchino” or “crescenza” original of Lombardy and Pedimont which is creamy, has a spreadable texture and no rind. It usually has a mild, slightly acid and delicate flavour. The bakeries and restaurant in the Recco area use, instead, only the cheese traditionally produced in the immediate backcountry, which is very similar to stracchino. If you cannot find stracchino at your cheese monger you can try to buy it online. For the US I found the website Sensibus which sell on-line stracchino. Otherwise you can try to make it at home! Writing this post I stumbled upon a website which gives you all the directions! Here is the link for the crescenza recipe. Pour the flour on the working surface, create a wide well in the center. Pour the water inside the well and two tablespoons of extra virgin olive oil. Little by little, with the tips of your fingers, start incorporating the flour into the water from the edges of the well always stirring. You do not have to incorporate all the flour! Just add flour until you obtain a very smooth ball of dough no more sticky but still very soft (the softness of the dough is one of the secrets for stretching it thereafter like a veil afterwards). Once you’ve made your soft dough, set aside the exceeding flour and start kneading and working it with your hands to develop the gluten in the flour for about 5 minutes. This will make the dough very elastic. You just have to bash the dough about a bit with the lower part of your hands, squashing it into the table, reshaping it, pulling it, stretching it, squashing it again, even beating in on the table. If it sticks to your hands, just dust the working surface with a veil of flour and continue kneading. Divide the dough in 3 small balls of the same size, cover with a cooking film or with a humid cloth and leave at room temperature for at least 30 minutes. Preheat the oven at 270°C (520°F). Grease a cake tin of 30×40 cm or of 24 cm of diameter with olive oil. Take one of the dough balls from the fridge (leave the other in the fridge) – do not knead it anymore! – and roll it with a rolling pin on a surface well dusted with flour. Roll until 1 mm (0,04 inches) thick. You can also use your hands to stretch the dough: when you have rolled it in a thin disk put it on the back of one hands and with the other gently stretch the borders of the dough in all directions. You shall obtain a disc wide enough to cover the cake tin and get out of the edges for a couple of centimetres (ab 1 inch). Don’t save flour! Use as much as you need to avoid that the dough sticks to your hands or to the surface (and remember remove any ring from your fingers!) Cover the cake tin with the rolled dough and grease the surface with a very thin film of olive oil. Repeat the same operation with another dough ball. Once the base of the pie is finished it is time to put the filling inside. Divide the cheese in chunks – size of a walnut – and spread them evenly on the surface. Cover the cheese with the last layer of dough finely rolled. Cut the dough in excess from the borders and roll the edges inside to seal the filling. Rip the dough and make some small holes here and there on the surface (yes, you read correctly. I know you put all your efforts to stretch the dough without holes, but now you have to make them for letting the air get out during baking). Sprinkle with some olive oil and salt. Bake in the lower part of the oven at 270°C (520°F) for about 6-8 minutes or until the dough is gold and crispy. The baking is so quick because the cheese should just melt without cooking. Serve hot! Pour the flour on the working surface, create a wide well in the center. Pour the water inside the well and two tablespoons of extra virgin olive oil. Little by little, with the tips of your fingers, start incorporating the flour into the water from the edges of the well always stirring. You do not have to incorporate all the flour! Just add flour until you obtain a very smooth ball of dough no more sticky but still very soft (the softness of the dough is one of the secrets for stretching it thereafter like a veil afterwards). Once you’ve made your soft dough, set aside the exceeding flour and start kneading and working it with your hands to develop the gluten in the flour for about 5 minutes. This will make the dough very elastic. You just have to bash the dough about a bit with the lower part of your hands, squashing it into the table, reshaping it, pulling it, stretching it, squashing it again, even beating in on the table. If it sticks to your hands, just dust the working surface with a veil of flour and continue kneading. Divide the dough in 3 small balls of the same size, cover with a cooking film or with a humid cloth and leave at room temperature for at least 30 minutes. Preheat the oven at 270°C (520°F). Grease a cake tin of 30×40 cm or of 24 cm of diameter with olive oil. Take one of the dough balls from the fridge (leave the other in the fridge) – do not knead it anymore! – and roll it with a rolling pin on a surface well dusted with flour. Roll until 1 mm (0,04 inches) thick. 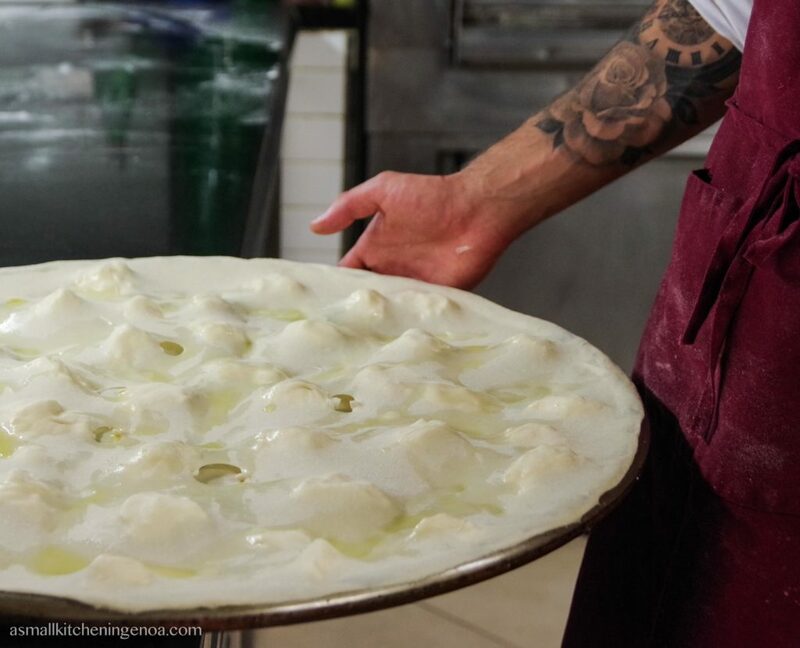 You can also use your hands to stretch the dough: when you have rolled it in a thin disk put it on the back of one hands and with the other gently stretch the borders of the dough in all directions. Cover the cake tin with the rolled dough and grease the surface with a very thin film of olive oil. Repeat the same operation with another dough ball. Once the base of the pie is finished it is time to put the filling inside. Divide the cheese in chunks – size of a walnut – and spread them evenly on the surface. Cover the cheese with the last layer of dough finely rolled. Cut the dough in excess from the borders and roll the edges inside to seal the filling. Rip the dough and make some small holes here and there on the surface (yes, you read correctly. I know you put all your efforts to stretch the dough without holes, but now you have to make them for letting the air get out during baking). Sprinkle with some olive oil and salt. Bake in the lower part of the oven at 270°C (520°F) for about 6-8 minutes or until the dough is gold and crispy. The baking is so quick because the cheese should just melt without cooking. Are you fond of the Liguria street food? Then do not forget to try also my recipes for making at home the famous traditional focaccia and farinata. Once you have mastered the pasta matta making you can try all the Italian Riviera savory pies, such as the chard pie, torta pasqualina (the artichoke pie), or the pumpkin pie. Did you like this recipe? If so subscribe to my NEWS LETTER and you will receive my next post straight from my kitchen to your inbox! Farinata: the Genoa chickpea tart. Than you Miranda 🙂 they will come, slowly, but they will! Thank you for your message, there was an error in the program. I fixed it, now the recipe is in English as well!